Intro Guide– Western most province of the country, entirely alpine. 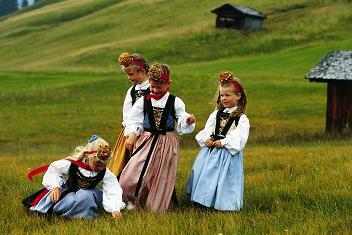 Dialect is most distinct from the rest of Austria. Vorarlberg – meaning: area / land before the Arlberg Mtn. Vorarlberg is a most beautiful province with step and gentle sloped mountains. 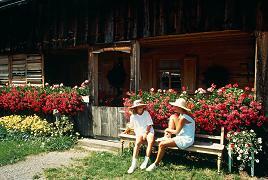 Vorarlberg also has historical and cultural delights for you to discover. Provincial capital – harbor, cultural center. The ancient Romans settled here 2000 years ago. Medieval town center and Baroque St. Martins Tower, with an imposing onion dome. 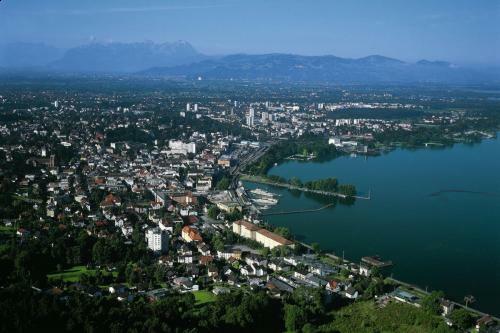 The Pfander- mountain overlooks the city offering a spectacular view of Bregenz, and the Bodensee stretching westward from Bregenz between Switzerland and Germany. The Bregenz festival with its open-air floating stage at edge of the lake has become a cherished cultural attraction world wide. 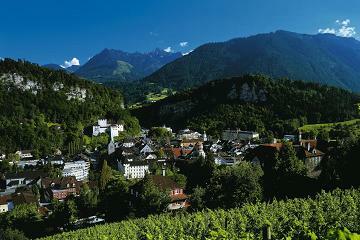 Settled since the Stone Age, the Raetians mined the region settling in the lower alpine areas of Vorarlberg. In 13 BC the Romans defeated the Raetians The region was part of the Roman province of Raetia (named after the conquered Alpine people) from 15 BC to 5 C.
The area was then conquered by the Alemanni - a German people, it became part of the Frankish kingdom by 593. The Alemannic descent contributes to the regional dialect which is very similar to the Swiss across the Rhine River. In the 14 and 15 C the Habsburgs acquired most of the area. Vorarlberg ranks 2nd only to Vienna in industrialization with more than half of the labour force engaged in industry and crafts. Vorarlberg is blessed with mountains, mountain lakes and rivers giving it a natural wealth that produces much of the Austria’s hydro-electric power. The provinces textile, clothing industries and hydroelectric power in the Ill and Bregenz river valleys make up a large portion of Austrian national production, including that for export. Watch and clock making are also significant sectors of the provincial economy. Industry is concentrated primarily in the Rhine and Ill valleys. Key industries are textile production, small scale light manufacturing, metal, pharmaceutical, crafts, mining, and tourism. Vorarlberg’s mountains and great scenery make the province a popular tourist destination. Summer time annual World renown Bregenz Festival. Opera and Theater on the Bodensee / Lake Constance. The Lake-front theater seats 6 500 guest. Music and theater Festival. Seebuehne – Largest floating Stage in the World, attracting over 100 000 visitors a year. -Recent location filming of latest James Bond movie, “Quantum of Solace” included scenes from the Casino and Lake Stage, of which one of the producers claimed that Bregenz was so James Bond.